PHILADELPHIA (AP) -- Mr. Sulu in Riverdale? Oh my! Actor and equal rights advocate George Takei, whose portrayal of the Star Trek character in television and film has made him a science fiction legend, is crossing a new frontier this week by appearing as himself in issue No. 6 of Archie Comics' "Kevin Keller," a series about Riverdale's only gay teenager. Takei, who is also gay, said his appearance in the issue that is released Wednesday dovetails nicely with his real-life advocacy for equal rights because it helps bring home his message that anyone can aspire to be what they want to be no matter who they are. "With Archie Comics, it's a fun way and a natural way and an ideal way of advocating happily," Takei said. 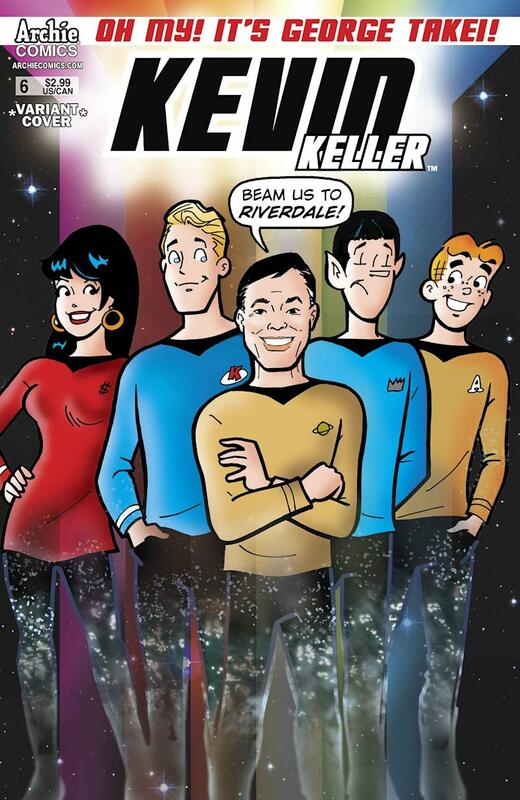 Jon Goldwater, Archie Comics' co-chief executive officer, said writer and artist Dan Parent "met George at a convention and asked him if he'd be interested in appearing in the Kevin Keller comic, and being a huge Star Trek fan I flipped when he agreed. Sulu was always my favorite character so I said do whatever it takes to get him in the comic." Takei, who is signing copies of the comic Wednesday at Midtown Comics in New York, was quick to say yes. "I remember as a preteen and a teenager, I used to read Archie Comics," said Takei, 75, who grew up in California. "I was so flattered." In the story Takei is the subject of an essay by Keller who cites him as an inspirational hero — not just for his acting — but his advocating on behalf of Asian-Americans and gays and lesbians, too. "I've always been an advocate. I grew up in two U.S. internment camps. I was too young to understand that at the time," he said. "As a teenager I couldn't reconcile what I was reading in my civics books with my boyhood." That led him to realize that he would have to speak out and up for equality, something he's been doing publicly since coming out in 2005. It's also gotten him nearly 3.1 million fans on Facebook where he blends humor, nerdiness and earnestness in his postings. "Humor plays and kittens play," he said of his page. "And I slip in a little advocacy in between because it's me." This Proves That Archie and Veronica Are Getting Back Together In the Next Episode of "Riverdale"